"Those speech bubbles are so cute." Cute? Well, yes, I admit they are darn good-looking speech bubbles. (Credit Sarah Pecorino for the lovely clip art in the photos.) But look past the cuteness and you'll see a tool. 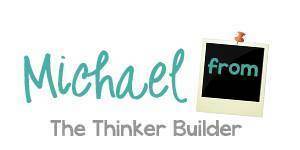 A tool that can reap intense thinking from your students during your reading instruction. 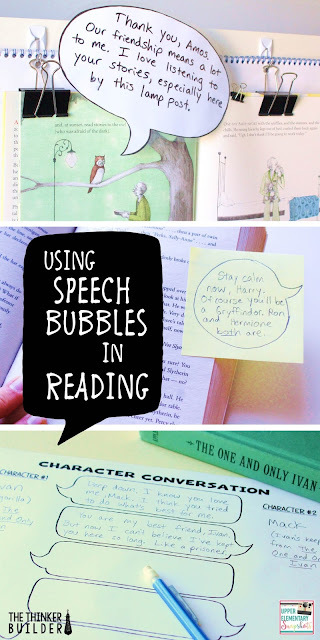 Try using speech bubbles as a vehicle for your students to interact with the characters in a text. To actually talk to a character. Doing so can entrench a student into the story. Not only are they following the plot, now they are putting themselves in it. Have them offer advice to a character, connect to a difficult situation by telling a character about a similar experience, or give information that would help a character out of a sticky situation. 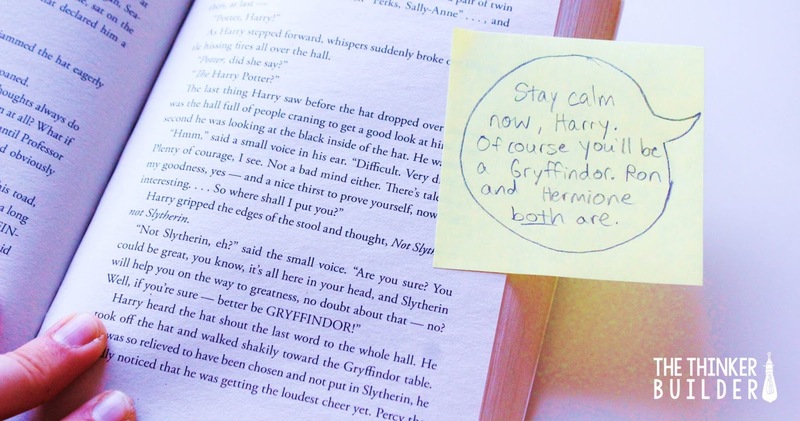 Sticky notes work perfectly to do this while reading. 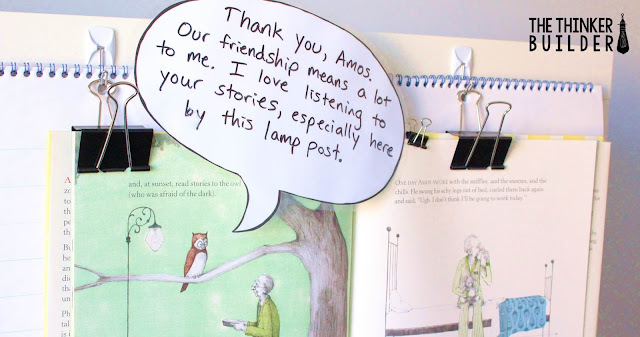 Students can pause, jot down a speech bubble, and stick it right in their book. 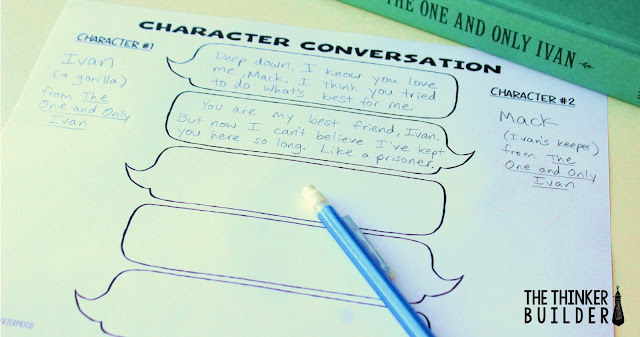 Pull two characters out of their story to create a conversation between them, similar to an exchange of texts to each other. Maybe tension exists between two characters and the author has yet to have them confront the situation. Or maybe the parameters of the story prevent two certain characters from coming into contact with each other. Force these interactions to occur with a character conversation. Having students make up the dialogue between two characters, dialogue that does not exist otherwise, puts the students in the shoes of the characters. Try the activity in partners, where each student takes on the role of one character. If there's no obvious topic for a conversation to revolve around, try giving a class-wide topic, even a random one. The key is to write the characters' dialogue to fit who the characters are. Sharing these conversations like a reader's theater makes for an engaging comparison! As a compelling spinoff, take a main character out of two separate books to try a character conversation. *Note: Be sure to click the photo above to download the free form. Give words to a character or animal who doesn't otherwise speak. 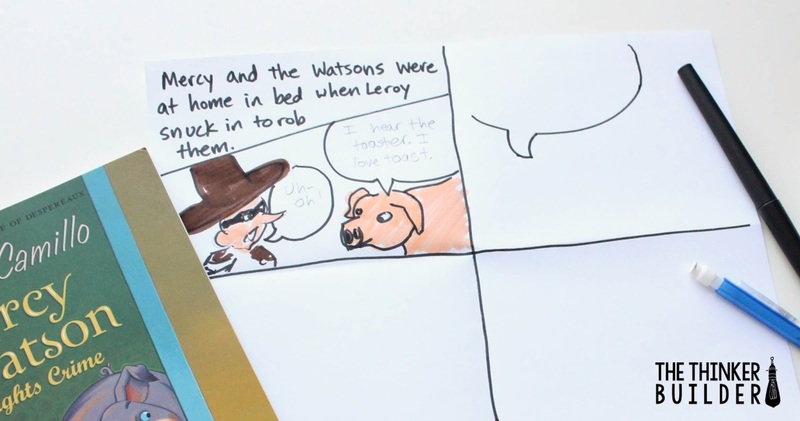 For example, in Shiloh, recording in a speech bubble what the dog, Shiloh, would say if he could speak allows you to see if students are making important inferences. 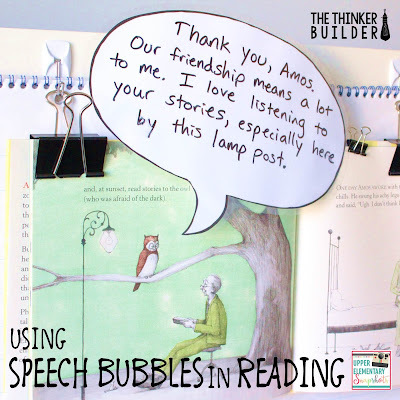 Try modeling this activity with a large, laminated speech bubble like in the photo. *Note: Click the photo to download your free copy. 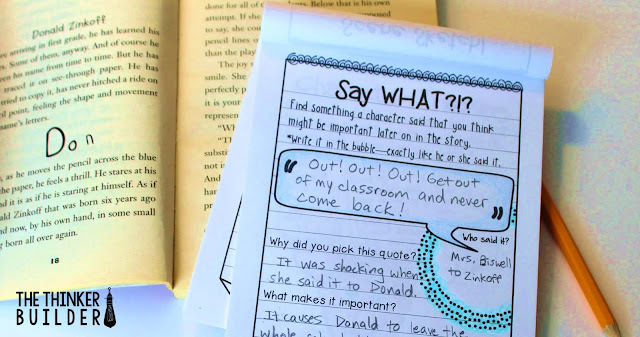 Use one chapter of a book (or a whole picture book) to have students decide the most important quotation uttered by one of the characters. Have them copy the character's words inside a speech bubble and then comment on why they chose it. What makes these words so significant? It reminds me of the "Say WHAT?!?" page from my Reader's Notebook Response Pages for Literature, where students choose a quote that might be important later in the story and answer questions about its importance. The use of speech bubbles within comic strips is most likely familiar to your students. Try having students give a summary of a book through a comic strip instead of (or to accompany) a standard written paragraph. Fold a piece of paper into fourths to create the boxes. Split off half the first box to allow for some set-the-scene narration, and then use the remaining spaces to complete the summary. There's a lot you can do with what characters say in a story, and a speech bubble is the perfect vehicle to get into it. 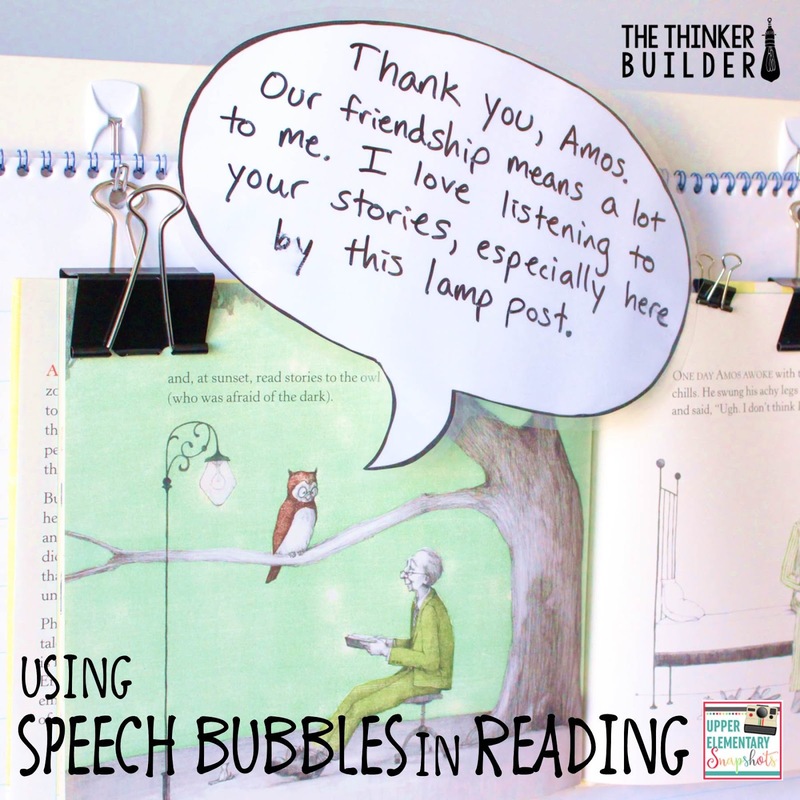 Come visit my blog and read about the Speech Bubble's more reserved, contemplative cousin: the Thought Bubble, and the cute deep-thinking things you can do with one! Read it HERE.